The Enterprise investigates the wreckage of a 21st century Earth spaceship orbiting a distant planet and the appearance of a casino with inhabitants based on a rather poorly written paperback novel. First Broadcast: 27th Mar 1989. Posted in Season 2, TNGTagged Astronaut, Data, History, Holodeck, Hotel, NASA, Riker, WorfBookmark the permalink. The woman doesn’t have 13, her hand was 15. Does that change your analysis at all? I didn’t bother to calculate the odds. But also, you’re assuming Data isn’t counting cards; he might be ‘counting cards’ assuming that’s how everyone plays (recall he reacted oddly to the question as to whether he does, he wouldn’t even need to count as he could calculate it immediately), and therefore might know a more accurate probability that would imply that the odds really were against her. In general I have to disagree on the with your assessment with this episode, I thought it was decent enough. But more importantly, it is hundreds of times better than the awful “The Dauphin”, which you ranked even higher than this, which I can’t comprehend. Unlike The Dauphin, to me this wasn’t a dull uninteresting filler story (I actually quite liked the story, being eternally trapped in man’s poor literary creations was unique & interesting concept for me and definitely not a let down, but I have nostalgic memories for this episode in particularly which may be biasing me), it had barely any Wesley & cheesy Wesley romance/coming of age subplots which are probably the worst things you can watch in Star Trek, and it didn’t have the terrible costume design of The Dauphin. It didn’t have the terribly cheesy acting of The Dauphin either, of course the people from the casino were acting very cliche and corny, but that was deliberate and the entire point of the episode, since it was based off of a corny and poorly written book as Picard and others note. So I simply can’t see how you could possibly rank this as worse than an episode as terrible as The Dauphin. If it’s because of technical errors and inconsistencies you may as well right of the whole of Star Trek, for me those things aren’t that important as long as the story and characters are compelling enough. To each their own I suppose. I agree with the podcast, this episode doesn’t belong in Star Trek, at least in the awful way it was implemented, but as an independent piece of low-budget sci-fi horror fantasy it has some merit. I think it was something of a homage to 2001: A Space Odyssey, where the astronaut ends up trapped by some higher life form in a world made to resemble his own; and as Kubrick wanted, we don’t actually get to see the alien as it would detract from the surrealism of the concept. 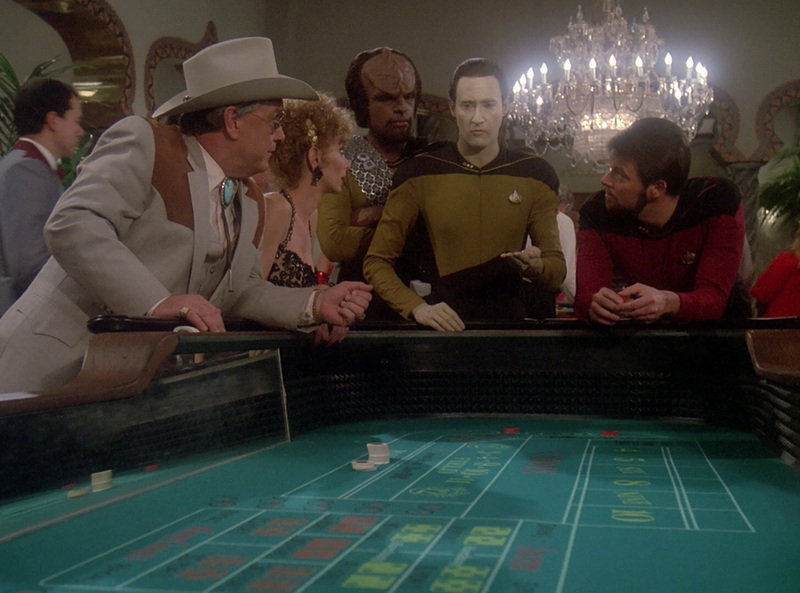 I liked how Data was able to fix the dice to win the game of craps; the astronaut wouldn’t have been able to do so and moreover couldn’t be described as “foreign investors” (plural) – besides, had he escaped the Hotel Royale he’d still be trapped on the planet. A minor quibble; the American flag portrayed in this episode did have 13 stripes as the present-day flag has, not 15 as mentioned in the podcast; though there was a difference beyond just the number of stars: the blue star-field is smaller, only occupying a height of 6 stripes and not 7 strips as per the present day flag. You can see this in image of the flag from the Charybdis debris on the Memory Alpha page of the episode to compare it to the present day flag. While I agree this was far from a good episode, mostly on technical grounds, I cannot rank it lower than “The Dauphin” episode.